Increasing numbers of U.S. troops have left the military with damaged bodies and minds, an ever-larger pool of disabled veterans that will cost the country billions of dollars for decades to come - even as the total population of America's veterans shrinks. Despite the decline in the total number of veterans - as soldiers from World War II and Korea die - the government expects to be spending $59 billion a year to compensate injured warriors in 25 years, up from today's $29 billion, according to internal documents obtained by The Associated Press. And the Veterans Affairs Department concedes the bill could be much higher. Worse wounds. More disabilities. More vets aware of the benefits and quicker to file for them. Also, ironically, advanced medical care. Troops come home with devastating injuries that might well have killed them in earlier wars. Time is also a factor when it comes to disability compensation costs. Payments tend to go up as veterans age, and an increasing number of soldiers from the Vietnam War will be getting bigger payments as they get older and are less able to work around their disabilities. The number of disabled veterans has jumped by 25 percent since 2001 - to 2.9 million - and the cause really is no mystery. "This is a cost of war," says Steve Smithson, a deputy director at the American Legion. "We're still producing veterans. We've been in a war in Iraq for five years now, and the war on terror since 9/11." VA and Census Bureau figures show the previous six-year period, before hostilities in Afghanistan and Iraq, saw a more modest increase of 4 percent in the number of disabled vets. Veterans can make claims for disability benefits long after their military service has ended. 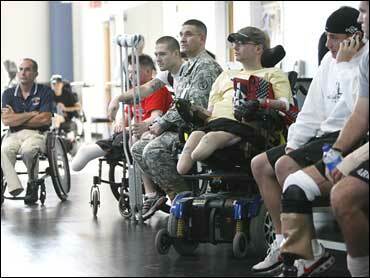 Today's veterans - disabled or not - number nearly 24 million. That population is projected by the VA to fall under 15 million by 2033, mostly because of dying World War II and Korean War vets. But costs are expected to rise. Inflation accounts for a big chunk of the increase. But even when the VA factors out inflation, the compensation for disabled veterans would still grow from $29 billion to $33 billion in today's dollars - a more than 10 percent increase. And the department acknowledges the estimate could rise by 30 percent. VA officials were not eager to talk about reasons for the increases. They declined several requests for interviews. In a written response to a handful of questions, the agency noted a few factors at play in the rising costs, such as the aging veterans population, an increase in the number of disabilities claimed and the severity of injuries sustained. Outside experts provided more insight. The American Legion's Smithson says the Iraq and Afghanistan wars are resulting in more severe injuries - amputations and traumatic burns - the kind of injuries that troops in Vietnam and earlier wars would not have survived. Smithson says today's veterans also are filing claims for more disabilities. "People are more aware of the benefits they are able to file for (because of) better outreach," Smithson said. "It's not like the WWII generation and Korean war generation where they weren't aware of what they could file for, and they were also reluctant to file if they didn't think they needed it." Iraq veteran Christopher Bain filed for about 10 disabilities after his tour in 2004. Bain came under mortar fire outside Baghdad and was hit several times. He successfully fought doctors who wanted to amputate his left arm. But 10 operations later, he still needs help getting dressed each day. An electrical stimulator implanted in his upper buttocks helps dull the pain from his injuries. "It's hard, you go through certain periods of remorse," said Bain. "I am never going to be the man I once was." Bain suffers from tinnitus, post-traumatic stress disorder and serious injuries to his arms. He receives a check each month for $2,618 that helps the former Army staff sergeant pay the mortgage, food and clothing costs for his family of five in Williamsport, Pennsylvania. Bain is one of about 755,000 veterans of the Iraq and Afghanistan wars. Of that group, the VA says more than 181,000 are collecting disability benefits. Another factor driving up costs and the overall number of disabled veterans is Vietnam. Veterans from that era make up the biggest group of vets today receiving disability compensation. At the end of 2006, more than 947,000 Vietnam vets were getting monthly checks. "You see an awful lot of Vietnam veterans over the course of the years have gone from a 30 percent to 40 percent disability rating up to 100 percent when their employment years start to wane a little bit," said David Gorman, a Vietnam War veteran who is executive director at the Washington headquarters of Disabled American Veterans. Conditions, such as a bad back or knee, can worsen with age and draw higher payments. A big concern for Vietnam vets is diabetes. Last year, more than 271,000 veterans were receiving disability benefits for diabetes. Most of the disabilities - 236,000 of them - were linked to Agent Orange exposure. Veterans who are approved for disability receive monthly checks for injuries or illnesses sustained or aggravated while on active duty. Ratings are scaled from 0 to 100 percent in 10 percent increments. A rating of 10 percent, for example, is given to tinnitus, or ringing in the ears, which is increasingly common for troops returning from Iraq and Afghanistan because of roadside bombings. Ratings for post-traumatic stress disorder and traumatic brain injury can range from 0-to-100 percent, and 10-to-100 percent, respectively. Former Army Sgt. Michelle Saunders was rated at 70 percent by the VA after being shot at during a 2004 convoy mission in Iraq. The bullet was caught in her flak jacket, but she sustained painful injuries, including two ruptured disks in her lower back and nerve damage to her right leg. "It's turned me from a really alive, pretty happy person into somebody who is numb. I don't know how to feel anymore," she said. Saunders gets a disability check each month from the VA for just under $800. Annual benefits run from $1,404 for a veteran rated at 10 percent to about $30,324 for those at 100 percent. Severe disabilities, such as the loss of a limb, draw additional compensation.